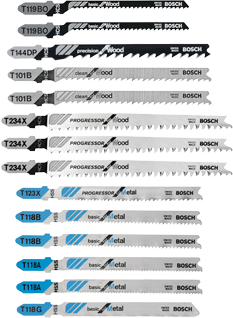 Assortment includes Bi-Metal, high-speed steel and high-carbon steel blades optimized for specific tasks in multiple materials. Excellent choice for remodeler, installers, and general purpose home use. Heavy-duty case included for convenient blade storage. T-shank design for maximum grip and stability which fits over 90% of current jigsaw makes and models.